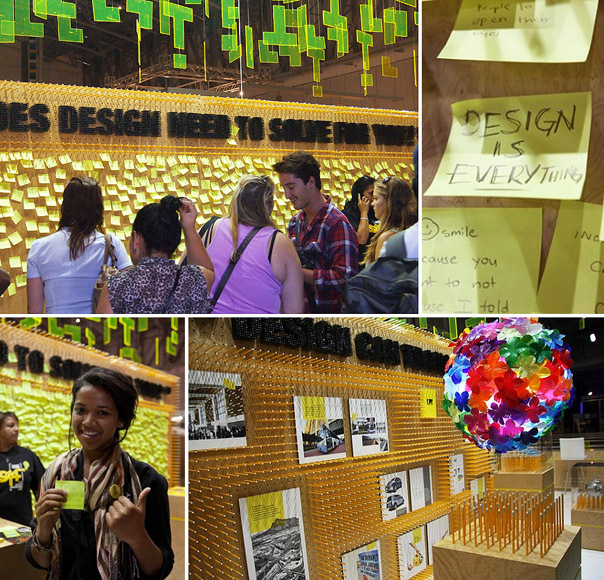 Design Indaba 2012: Expo of Creative & Interactive Thinking? Just exactly do I mean when I say “creative and interactive thinking’? Well without going into the whole long description, I will just give you my take on it within the context of the Design Indaba Expo 2012. To me, (and remember that this is my opinion and not the official take of Design Indaba…. Although I would hope that I am not too far off the mark) this Design Expo is the ideal event to bring the power of the interactive, creative thinking of design to the public and those in the trade. It should serve to heighten awareness of how creative thinking and processes are at work in our daily lives, as well as motivate all towards interacting with these design processes daily. It’s not just about the projects and the products. 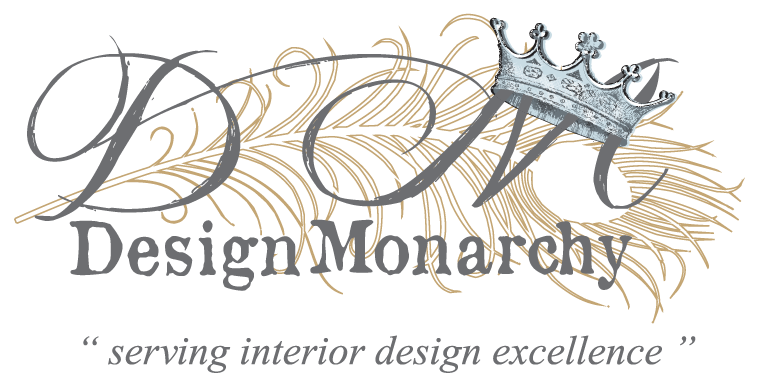 It’s bigger than that… it’s about letting design ideas materialise and tell its story. The question then is: Did this year’s Design Indaba actually achieve this objective? I would say a resounding YES to that. I spent two days in the conference being bowled over by the power of international creative minds, and one whole day covering the exhibitors stands in the Expo… it was mind blowing, motivating and more. I’m kicking off my side with a very brief look at what impressed me most at the Design Expo. As you can well imagine that is actually quite a daunting task mainly because just about everything and everyone was impressive, really it was. How do you choose to mention but a few of these impressive designers and their projects? That is why I have decided to get of the starting blocks more along ‘neutral’ grounds for want of a better term. Whilst touring the Expo, I became very aware of the fact that there were many exhibitors/brands that had ‘Interactive Stands” – in other words the public could actually step into their space, were given some tool or instrument (pen, paint and brush, stickers, photos, etc.) with which to interact with the brand’s stand. These exhibitors had clearly applied serious creativity in their efforts of bringing brand awareness to the public, inducing clever and creative interaction with the crowds. Here you could write a message on a yellow Post-it type paper and attach it to a very big pencil-filled interactive board. Do yourself a favour and read some of the post-it quotes on their website: here. Here you can see some ladies sticking their colourful entry cards unto the allotted black & white block. 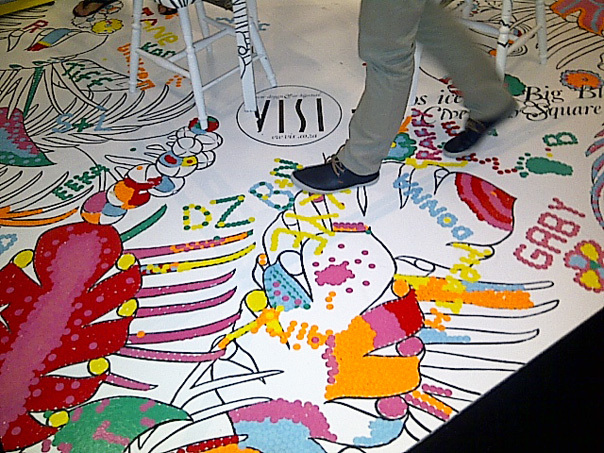 The back walls and the floor of their stand was covered in an outlined graphic image. What you did was grab a few circular stickers and begin to fill in the gaps. Thousands and thousands of stickers later, the stand was a total splash of colourful images. Great success I would say. 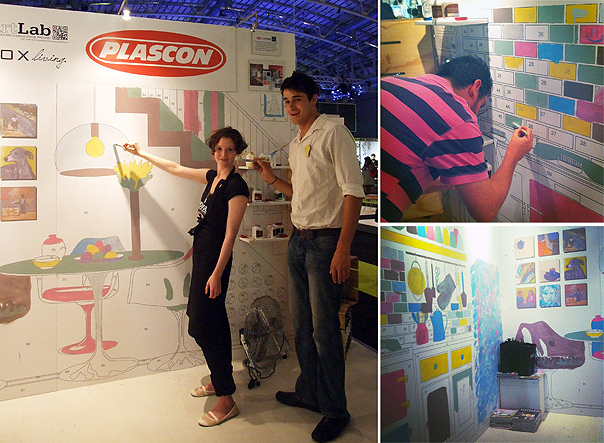 They too covered their walls with images and blocks, provided the visitor with a paint brush and paint in Plascon’s latest contemporary colour trend palettes. With that you could make you mark in one of the blocks on the wall. Check out House & Leisure’s website for the story behind the stand and more images. This was a source of major entertainment for the largely younger visitors or the young at heart. 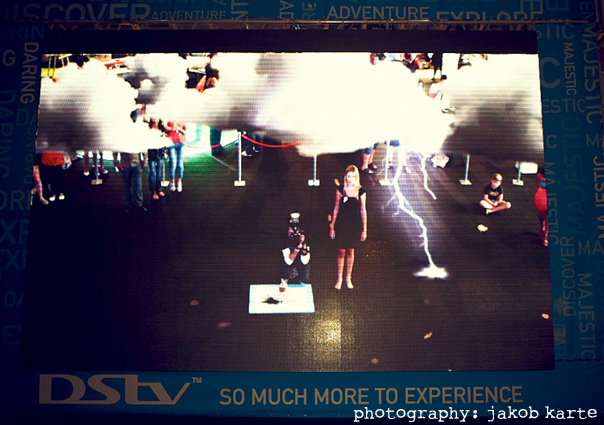 A really huge plasma screen stood tall, with cameras capturing the crowds as they passed by. BUT, added into the mix, you could step onto a digitally operated pad mounted to the floor in front of the screen, which then activated interactive digital images next to or above your image. Like a rain and thunder storm breaking over you or animals were interacting digitally with you. Quite out there stuff. Too difficult for moi to fully explain, but memorable obviously. The MTN exhibition stand was that of a huge Perspex cube, built in sections. 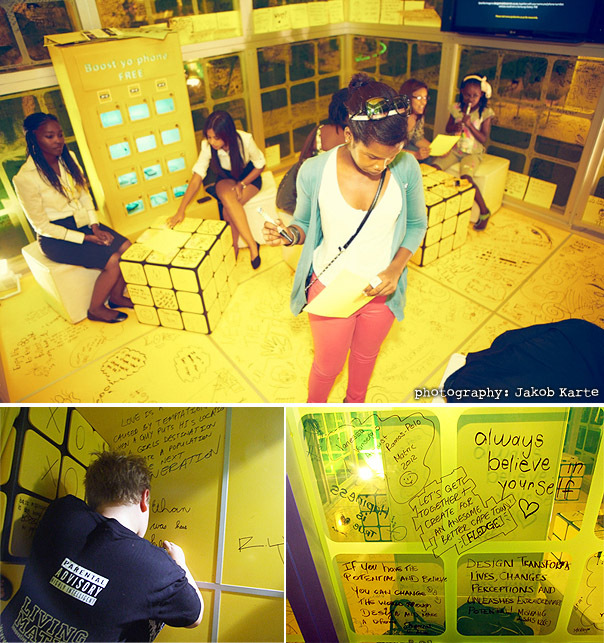 The visitor could step into the cube and write a message on the Perspex cube walls, using a black marker pen. Cool. 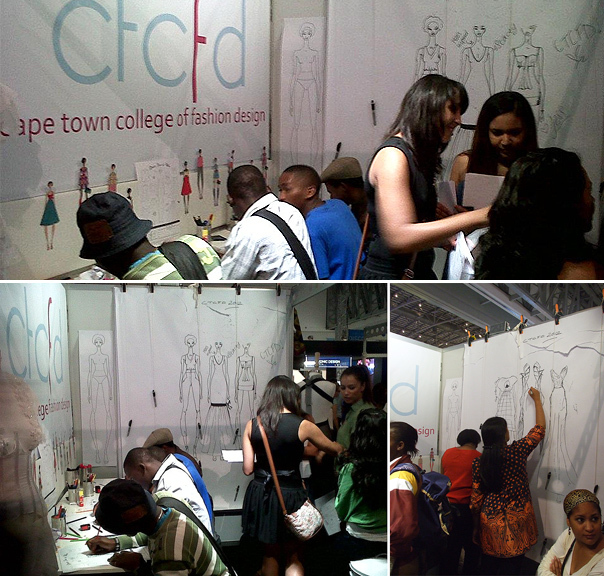 Cape Town College of Fashion Design had people sketching fashion outfits on their back walls. Yes, you are definitely reading correctly – even the Post Office got into the interactive space. Their mime artist clad in a white outfit, clutching a black marker pen, roamed the passages of the hall, encouraging visitors to write meaningful words and phrases about sending out post/letters. All this interaction really kept the crowds busy. I think it is an innovative way of creating brand awareness and standing out in a crowd of exhibitors, particularly since creative thinking was what this expo was all about. 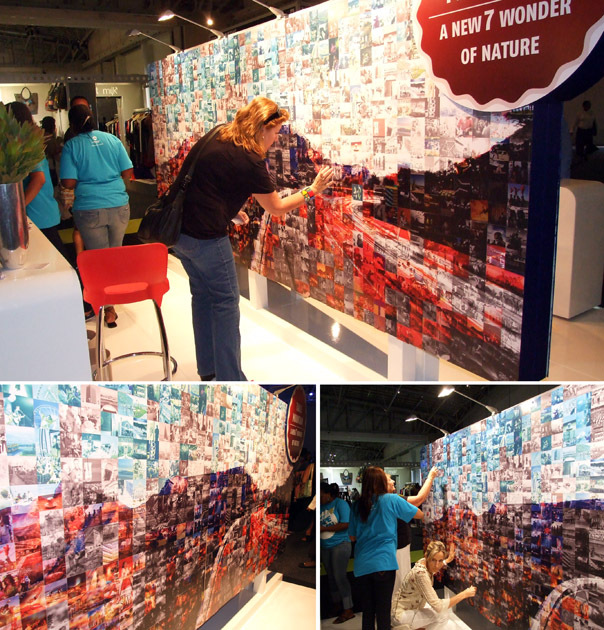 I noticed that Cape Tourism had a stand which drew little or no attention to it, yet it had all the potential in the world to be stand out, if it was interactive? Seriously does not say much for their creative thinking at a design expo. THAT IS WHAT IT IS ALL ABOUT AFTER ALL… GETTING THE MESSAGE OF CREATIVE THINKING OUT THERE. Great post, Rose. Wish I could have gone!